Art supplies are not cheap. 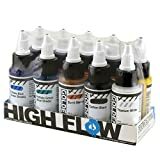 If you need a really affordable solution for trying out this exciting Acrylic pour painting technique then get one of our pre-selected fluid art kits for beginners from Amazon. Keep in mind that getting all the pour painting supplies will not automatically guarantee a smashing success for all of your future fluid arts masterpieces. You’ll have to understand the nature of acrylic paints and why they behave differently with various liquid additives. If you’d like to know more about the materials needed for creating amazing abstract acrylic paintings using pouring techniques keep reading the entire post. If you don’t have the time or patience then simply read the short version below. *Acrylic pouring can also be used as a supplemental technique for painting florals, landscapes, and a great number of other subjects. 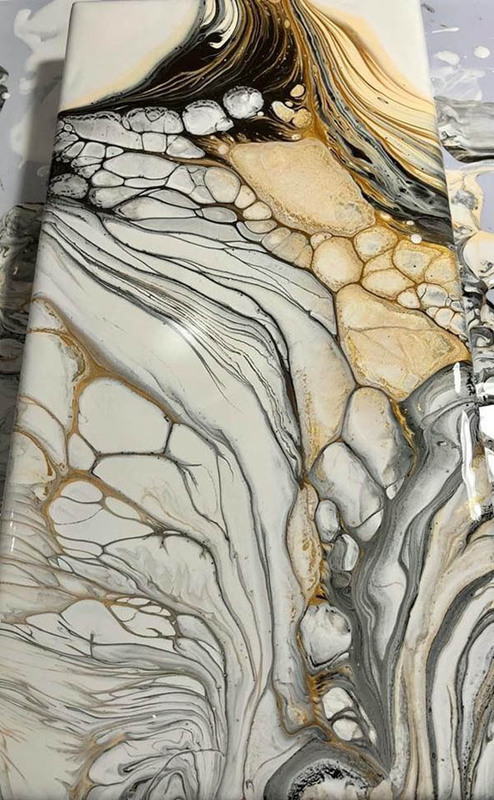 The distinct acrylic pouring “swirly” patterns are created because the paint is liquid enough to flow freely on the canvas and the paint’s viscosity is high enough to prevent colors from fusing or intermixing after they have been poured onto the canvas. Adding too much water can reduce the paint’s viscosity and surface tension resulting in all colors blending together. This is why Floetrol or similar pouring mediums are used in conjunction with the small amount of water to achieve the optimal viscosity of the paint. Water and oil do not mix together. Oil is lighter than water and if you will mix it with acrylic paint it will be lighter than a paint layer without oil. Eventually (or after using the “swipe” technique) some of the oil-containing paints will float up to the surface through the heavier paints. The distinctive pattern with random cells is formed and your acrylic pour painting artwork is born with just a little help from you. For those enthusiasts who’d like to dive-in without reading boring instructions and figure out all particulars on-the-go, we compiled a basic acrylic pouring starter set. Note that Acrylic Pour Painting is amazingly easy and becomes addictive! If you had any other hobbies, like coloring books, drawing Zentangles, or crochet, then acrylic pouring may become your most satisfying new passion right from the beginning! If you would get all the right pouring supplies and set up your art studio, be ready for almost instant success. You’ll be surprised how quickly you’ll learn the basics and how quickly you will run out of your initial pouring art supplies. 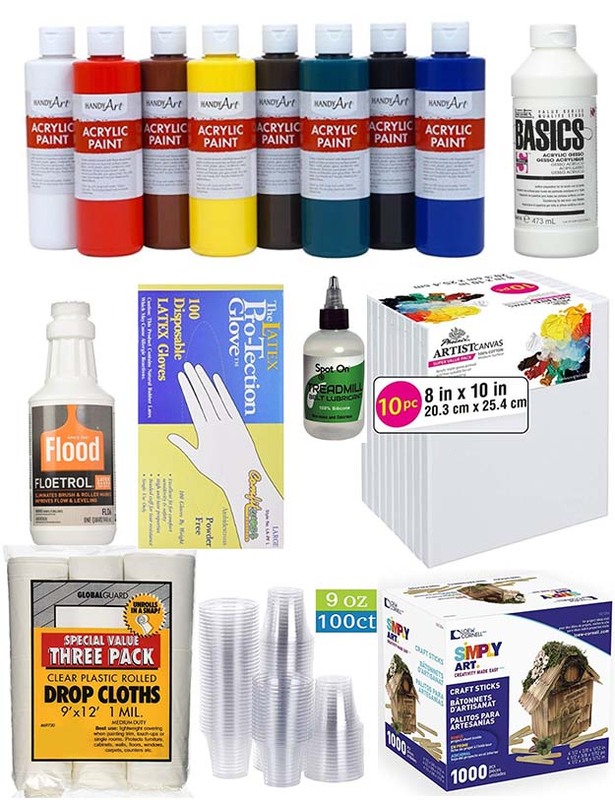 To help you get started, we compiled some acrylic pouring starter kits. 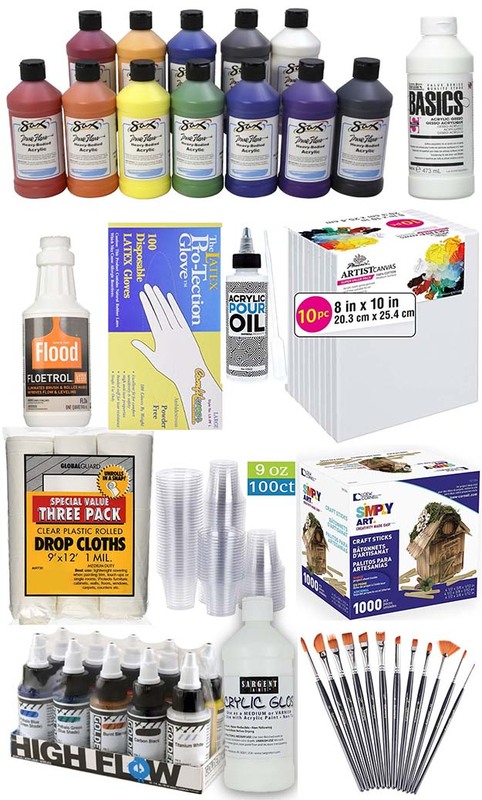 With just one button click you will be able to place all items from each acrylic pouring kit listed below in the Amazon shopping cart. Of course, you will have an option to delete the ones that you don’t need or add other products. 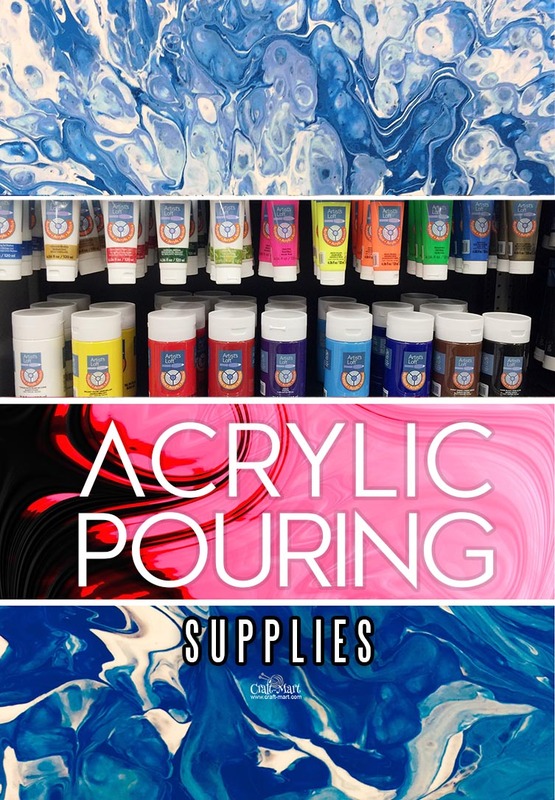 Some of you would want to get acrylic pour painting supplies locally. 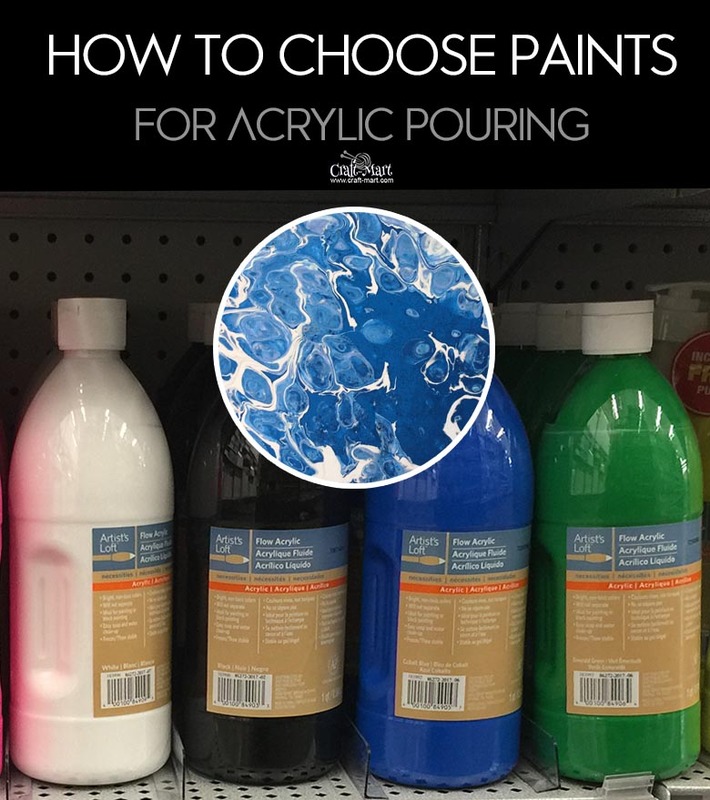 What kind of paints do you need for acrylic pour painting? For beginners, it makes sense to get some basic understanding of what kind of paints you would need to get for successful acrylic pouring and why. As you’ll be practicing pour painting techniques, your paints should be liquid (high flow). If you are not able to pour your paint out of the container easily then it is a wrong type of paint! If you are buying tube sets make sure that these are not extra thick paints for impasto technique. Such paints are formulated to preserve brush strokes and may not produce consistent results if diluted with too much water! Don’t spend too much money on buying each and every color! Get just a few primary colors in larger containers instead. You can mix almost any color you need using these primary colors. Use saved money to buy more canvasses and pouring medium to practice your new skills. What exactly is this acrylic paint? Acrylic paint is simply is a mixture of acrylic polymer emulsion called “the binder” or “the medium” and a pigment that gives the paint a particular color. 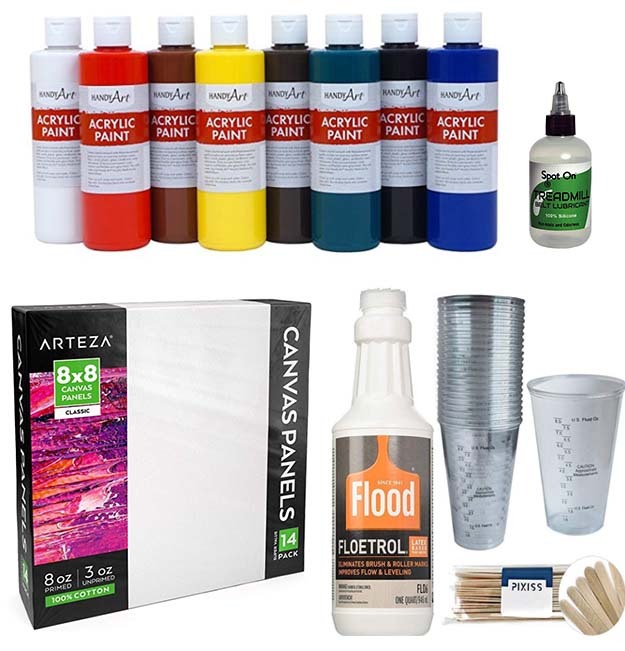 Acrylic paints and mediums dry through the evaporation of water and liquid solvents. A completely dry paint, while retaining flexibility, becomes water-resistant. Besides polymer emulsion and pigments, acrylic paints almost always contain various amounts of “fillers” that help with thickening the paint’s film and creating more opaque layers. Student grade acrylics – are these good enough for pour painting? Less expensive “student” grade acrylics usually are made with cheaper artificial pigments that have much smaller particle sizes than more expensive natural pigments. More fillers are added to these “student” grade paints to achieve a better coverage. Should you get acrylic paints without these fillers? Are these fillers bad? No, without fillers, these paints would have been performing like transparent inks. Even expensive professional acrylics must have a certain percentage of fillers. Note that professional grade paints are rarely used for acrylic pouring due to much higher prices and limited availability in liquid form. Where can I buy acrylic paint and pouring medium? 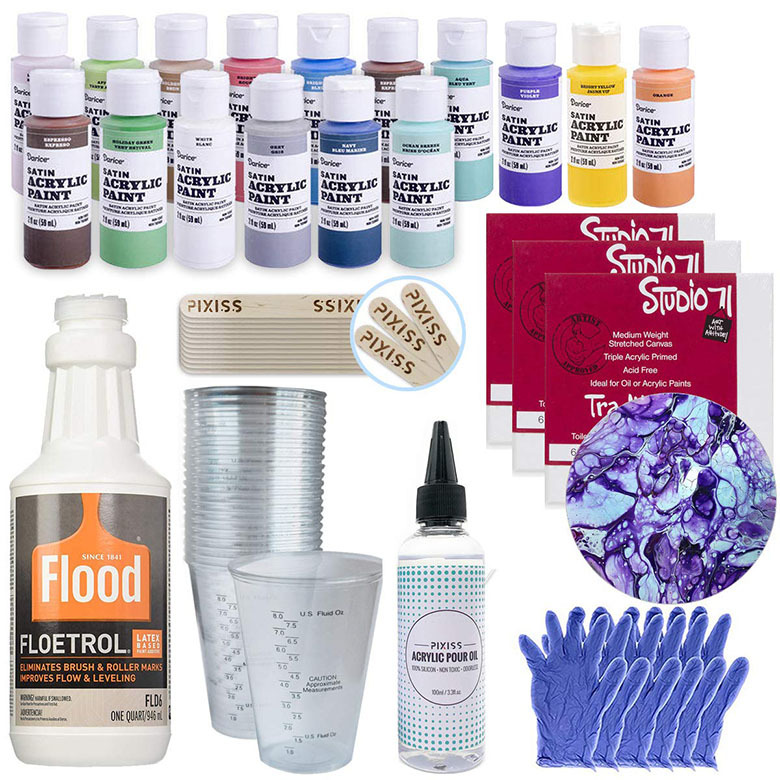 Besides your local art and craft stores, there are a few places online where you can get fluid acrylics at reasonable prices. Below are just a few examples of what is available. Some beginners think that they can just open the bottle and start pouring immediately. Even the most expensive paints need pre-mixing before using. Always mix paints before using and add small amounts of water if they are too thick. For beginners on a tight budget, this 8 primary acrylic paint set is a good choice. Mixing the right colors is what real fine artists do. Fluid artists have easier tasks yet they still need to learn color mixing theory for pouring well-balanced color mixes. Once you know that yellow and blue will make green and red and yellow will produce orange, the rest is easy. 12-color acrylic paints set is also a popular choice for paint-pouring enthusiasts. You’ll have enough paint to experiment and practice different fluid painting techniques. Just keep in mind that this is not a professional-grade paint suitable for fine brush painting. So, if you will decide to take an art class you’ll need to buy acrylics in tubes specially formulated for brush application. This color set seems to be very expensive compared to the big-bottled ones. But when it comes to pour-painting applications, Golden High Flow delivers superb results. It has an extremely high pigment content, minimum fillers, and just the right consistency to be mixed with Floetrol® for a perfect acrylic pouring recipe. Golden Acrylic High Flow inks provide unstoppable color that can go from brush to marker or from fountain pen to airbrush, and beyond. Perfect for Acrylic Artists that want fine line detail, staining effects and leveling colors, as well as Calligraphers, Mixed Media Artists, and Airbrush artists. High Flow Acrylics work great in refillable tools and are incredibly flexible. 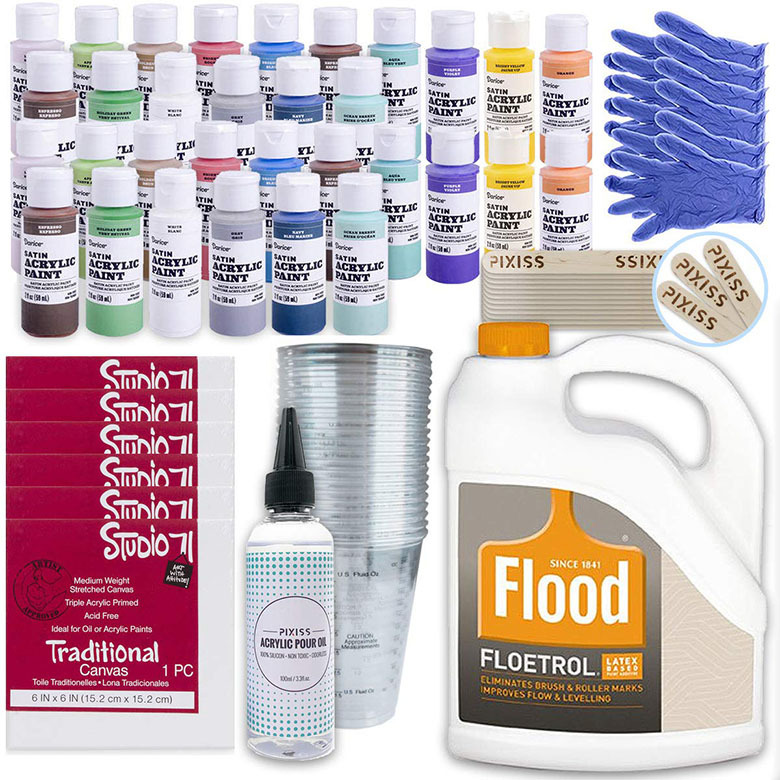 What is Floetrol® and why do you need it for acrylic pouring? Floetrol® is basically a transparent liquid resin that can be mixed with many types of water-based paints like flat or semi-gloss latex, enamel paints, Acrylic, or Vinyls. Floetrol® helps these water-based paints become more liquid without losing gloss which happens if you will add water instead of Floetrol®. Using just water (in large volumes) for making paints more liquid will reduce surface tension which will make colors blend without a distinctive border. Combining water and Floetrol® will prevent colors from excessive blending while making paints more fluid. Recently paint manufacturers increased the selection of low viscosity paints that are more suitable for fluid arts. But even these high-flow paints often need further dilution in order to create certain pouring effects. Pouring paint means that you are actually able to pour acrylic paints on the canvas. Keep in mind that most of the acrylic paints are usually sold in a low-fluid state. Many artists prefer these thicker paint for the “impasto” technique when paints are not diluted with anything in order to preserve 3-D brush strokes. Try to avoid buying thick acrylic paints if you want to master acrylic pouring. What are the Benefits of Floetrol®? Floetrol® will help to make paints as fluid as a cream which is exactly what’s needed for perfect acrylic pouring patterns where colors are flowing without too much intermixing. Floetrol® makes water-based paints easier to work with, especially in hot and dry weather conditions. This is especially important when you are working on a large size artwork using multi-step techniques that may take a long time. Floetrol® can help with slower paint drying when a high temperature is causing your water-based paint to dry too fast. Floetrol’s manufacturer recommends mixing up to 8 ounces of Floetrol® per gallon (1oz of Floetrol® per 16oz of paint). This is the recommended amount to start with and then you can gradually increase the amount as needed. Once the paint is flowing well, you can stop adding Floetrol®. Mix Floetrol® with acrylic paints really well checking for lumps and testing liquidity on a piece of cardboard. What happens if you add much Floetrol®? Using too much Floetrol® can result in the low opacity of the paint layer after drying. Acrylic colors have different opacity indexes because some pigments have smaller particles and some have larger ones. Even if you are using a new white canvas you want your paints to be pretty opaque. Why should you care about paint opacity? After drying, translucent colors will look darker or even muddier because of the visible texture of canvas. You can also see that canvas plays an important role not only in acrylic pouring but also in any fine art painting. Floetrol® alternatives and where to buy Floetrol®? Naturally, you’d think that Art and Crafts Supplies stores would carry Floetrol but, sadly, they do not. Instead, you may find a few Floetrol® fine art alternatives such as Liquitex pouring mediums or Golden that are marketed as “specially formulated” for using with high-flow acrylic paints. if your local stores do not carry Floetrol® try to find its alternative called Thin-x. Different name but pretty close results. Should you get these professional pouring mediums for 2-3 times the price of Floetrol®? Not according to the below side-by-side tests. With a couple of the basic acrylic painting techniques, Floetrol® performed as good as professional Liquitex pouring medium. What’s even more surprising, after drying Liquitex finish had clearly visible pinholes and some other minor imperfections while Floetrol’s painting had an almost perfect surface. Therefore, if you trust these paint pouring art tests, the correct conclusion would be buying Floetrol® since it’s considerably cheaper. Locally, you may find Floetrol® at many hardware stores such as Home Depot or Lowes. Lowes Floetrol® comes in gallon containers while Ace hardware may have it in quart bottles. Walmart and Amazon sell Floetrol online if you live too far from Lowes or Home Depot. The acrylic pouring technique has created some truly awesome pieces of art. Between the vibrant, complex color combinations and the dreamy, flowing patterns, artwork created through acrylic pouring can look absolutely stunning. Though these pieces seem intense and challenging, they’re actually easy to create in the comfort of your own home. The materials are simple, as long as you have Flood Floetrol® in the mix. Try your hand at acrylic pouring with our step-by-step guide below – you might be better at it than you think. Each paint color needs to be mixed in separate cups. This is to keep the paints from mixing together and to properly mix the right amounts of Floetrol® with the paint. *(CM) Don’t just use the basic colors straight from the bottles. Create some combinations in each cup and then add silicone. 7. Take the canvas (or another object) you’re about to paint on, flip it upside down and place it canvas-side down over the plastic cup. Keep the cup against the flat canvas surface, and flip them both at once so that the cup is facing down and the surface is facing up. 8. When ready, lift the plastic cup filled with paint and it should all flow outward. 9. Change the direction and outcome of the painting by tilting the surface, using a paintbrush to move colors, or using air sprayers to direct the paint. 10. Let dry for 24 hours, ideally on an elevated surface so air can ventilate the bottom of the canvas as well. Acrylic paints basically contain two main ingredients. The first one is the pigment that actually gives each paint its color. Pigments can be natural or artificial. The second ingredient is the binder called “acrylic polymer emulsion“. This is the liquid part of the paint. Once the acrylic paint is dried it becomes a waterproof plastic polymer. The binder resin in the acrylic paint is artificial and is made generally from the monomer methyl methacrylate and also any real common catalyst. Before mixing and pouring large amounts of new paints it is always a good idea to test each color separately for opacity. 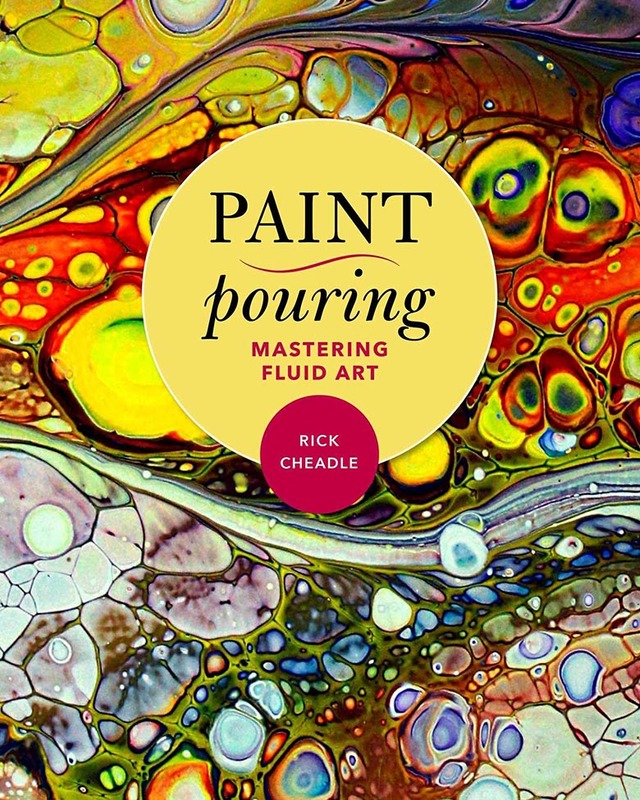 This book provides everything you will need to become a paint pouring or fluid artist.